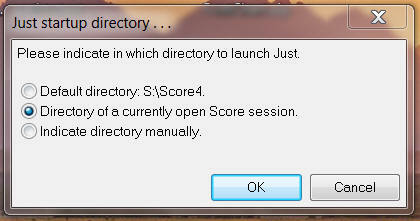 This macro launches the Just program within ScorBox. In “just-location.txt,” indicate the full path to the location of your Just.exe. “launchonly.top” is the initialization file for DosBox; once you have ascertained that the initialization file works on your system, you should not have to modify it further (see the discussion on the “DosBox” page). In “drive-mounts.txt,” indicate all the drives you would like to be able to access while working within ScorBox. In “default-drive.txt,” simply indicate the drive you consider to be your default for working with ScorBox. On my system, that is S:\. On yours, it might be C:\. In “default-directory.txt,” indicate the directory within which you would start ScorBox by default. This is similar to the indication of your startup directory for CMD.EXE. In “program-names.txt,” indicate the actual names of the executables you wish to launch. For instance, if when launching Scorlas you actually launch SCORLAS4.EXE, you’ll need to indicate that in this support file. Further instructions for the modification of this file are included in the file itself. “getShortPathName.bat” is a batch file required in order to obtain 8.3 nomenclature of long path names. This batch file must be present in your ScorBox support directory, but you should not change it. 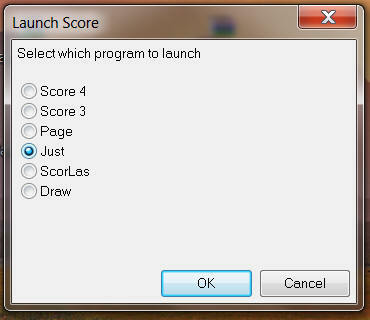 “path.txt” will contain the path statement required to launch ScorBox successfully; follow the prompt. “mode-settings.txt” will initially contain the following statement for launching MODE.COM as part of the launch procedure: mode con: rate=32 delay=1. These parameters attempt to address keyboard issues you may encounter when launching ScorBox. Should you encounter keyboard issues, you may have to experiment with changing the settings within the “mode-settings.txt” file to suit your needs. 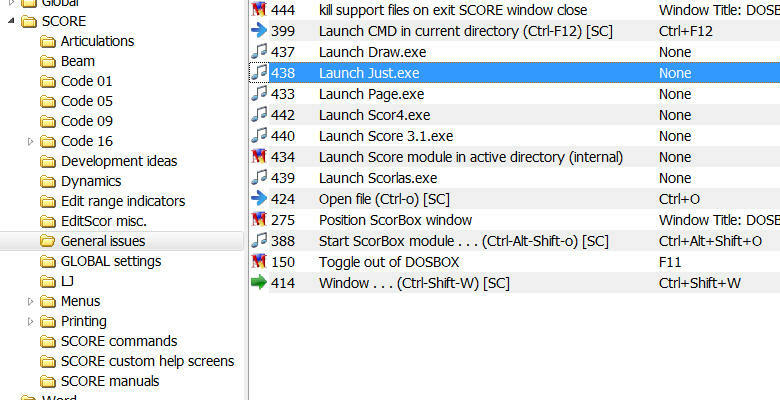 To view a video illustrating the ScorBox launch pad and the launching of Just.exe, go to the “Start ScorBox module” page. Added support for two additional support files: “path.txt” and “mode-settings.txt”. The user should import the revised macro into Macro Express. The new support files will be created automatically when launching the revised macro for the first time. The revision requires the installation of this revised Macro Express module, available on the “Required Macros” page, and the installation of the new support file “program-names.txt.” If you have previously downloaded and customized the other support files, you can leave those as they were. initial posting: 14 March 2011.